Twas the first morning of Christmas break and I wake to the call, of my eldest one calling my name down the hall. I jump from my bed and rush to her side to make sure she's ok and doesn't wake little sister sleeping beside. I motion for her and we sneak out the door, get into my bed and hope to sleep some more. You see the last few nights I've been up way too late. Bed before midnight is a thing of the past and getting up at 6 to get Claire to class. Sleeping all night is a fable you see, because when you're 9 months pregnant you must get up to go pee. Work up the momentum and roll out of bed. Limp to the bathroom like you just woke from the dead. Insomnia strikes and can't go back to sleep. Pick up the phone and give Instagram a peep. Now back to the current situation at bay, I hear little footsteps rush out to play. I take her to go potty before putting her in bed but alas there lies a Barbie whose hair must be braided instead. We climb into bed with Barbie in tow. And now there lie two little girls in a row. 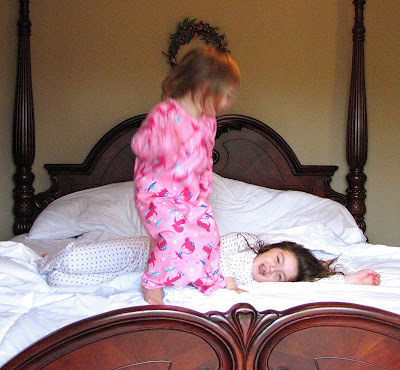 Not long thereafter the giggling begins, because with two little girls the fun never ends. So up before 7 is how this day begins, to bake cookies for Santa and family and friends. A trip to the park and the little train station. And await our new baby and moms hospital vacation. I hope everyone is enjoying their holiday! !